Have you ever been out shooting and heard someone say something like "Come up three and a half minutes and left 2 minutes" and wonder what they were talking about? It wasn't pagan voodoo, and by the time you get done reading this article you will know exactly what that meant. Lets take a look at the MOA system and how shooters use it to accurately engage targets. The MOA (minute of angle) system, as with every rifle sighting system, is based on the trigonometric shape of a circle, and how measurements are taken within that circle. The definition of minute of angle is one sixtieth of a degree. This function is based on the fact there are 360 degree's within a circle, and 60 minutes within one degree. 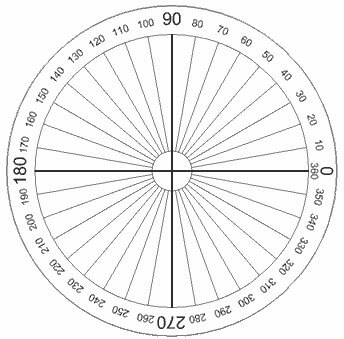 If you were to point your finger at the center of your monitor, then spin in a complete circle and end up pointing back at the center of your monitor, you will have moved 360 degrees. This is a pretty basic concept that we are taught early in our first geometry classes. As you can see in the diagram below, one degree is a small area of the outside of the circle. One minute, or one MOA is 1/60th that size and an even smaller area. Shooting is an angular sport, so you need an angular measuring system that takes this into account and allows precise sight adjustments to allow you to hit your target. The size of one MOA is always constant, meaning that 1 MOA is 1MOA regardless of the distance. The vertical or horizontal area that 1 MOA covers is what changes with distance. For instance, 1 MOA covers 1.047" at 100yds and 1 MOA covers 2.094" at 200yds. They are both 1 MOA, but the target distance changed, hence making the area they cover larger the farther away you get from the point of origin. You've probably noticed by now that the linear area that 1 MOA covers at whole numbers we are used to working with is not convenient. It is not nearly as big of a deal as it appears to be, and here is why. With 1 MOA equaling 1.047" at 100yds, this means 1 MOA equals 10.47" at 1000yds. I have never met a shooter that could shoot to within a half inch of error at 1000yds. So while there is minor error inherent with using whole numbers when talking MOA, it is not very detrimental in the real world. So, typically you can say that 1 MOA equals 1" at 100yds, 2" at 200yds, 12" at 1200yds, and so on. Just remember that the farther the distance to the target, the greater linear error it will be. Thankfully the linear measurement of a MOA at any distance is virtually useless when you are shooting. That last statement usually raises a few eyebrows. I have stated that shooting is an angular sport, so let me explain why. Say that you are shooting a target at 100yds. The first shot you take falls low. You can see the bullet hole in your scope. You know you need to make a sight adjustment to bring the rounds on target to get zeroed. One way to do it is to measure the distance from your point of aim (POA), to the point of impact(POI). You have a target with 1" grid squares, and you see that your shot fell 2" low. So you go back and adjust your elevation turret up 8 clicks. (based on 1/4moa clicks) Your next shot hits dead center. The problem with this technique is two-fold. It only works at a glance at 100yds, and it requires you to go to the target to measure your correction. At 100yds, you know that roughly 1" equals 1 MOA, so you can dial the adjustment easily on your scope. What if you are shooting at 363yds? Now, not only do you have to break out the calculator to see what your adjustment will be, you also have to walk 726yds with a tape measure! If you can drive to the target, it makes this a lot easier, but you still have to do the math. Lets try a different method of making a sight adjustment for the same situation above. You take a shot at 100yds, and again it falls low. Rather than getting up to start walking, you simply use your scope's reticle to measure your required correction. Here is where making the correct choice when buying a rifle scope will save you a lot of trouble. 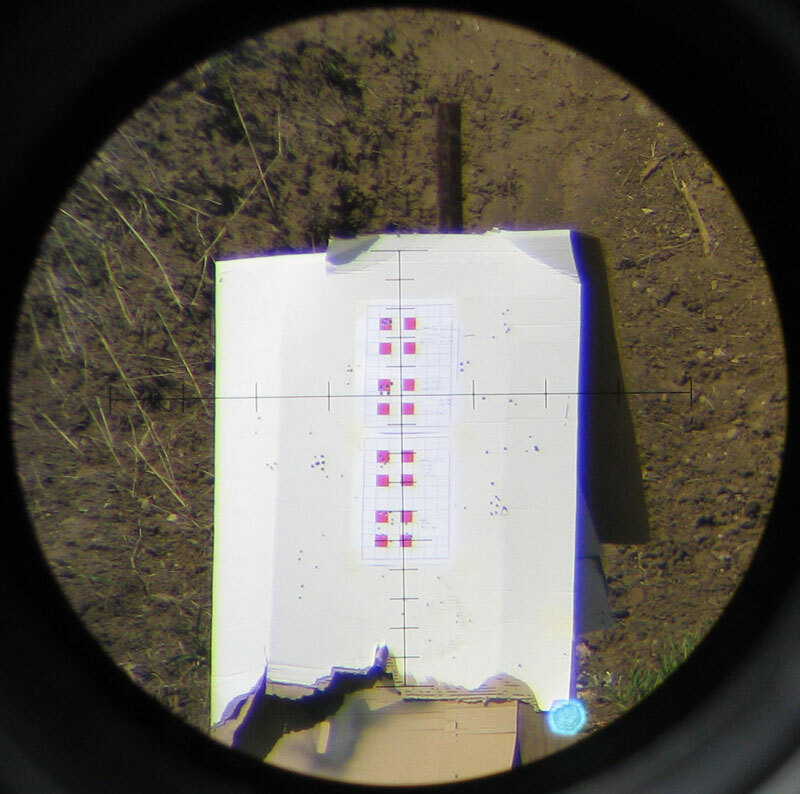 Below you see a picture of targets at 100yds with 1" grid squares as viewed through a nightforce 5.5-22x50 with an NP-R2 reticle. Not your grandfathers duplex eh? 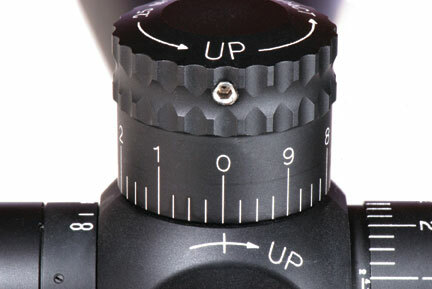 Modern reticles are designed with more points of reference to make this type of adjustment easier. The vertical line in the crosshair is sub-divided into 2 MOA sections. That means if you go outward up or down from the center of the crosshair, each line equals 2 MOA. If you were to go 3 lines down, that would be a 6 MOA. The horizontal line is subdivided into 5 MOA sections. These specifications simply detail the NP-R2 reticle from nightforce. Other reticles from nightforce and other manufacturers will have different designs. We know that the vertical lines are spaced 2 MOA apart, so lets say you took the first shot and it fell low. You aim your crosshair in the exact spot you were aiming when you fired the shot, and you see that the bullet hole is 1 line low, and 1 line left. You now know that you hit 2 minutes low, and 5 minutes left. You hit low and left, so the adjustment you need to make is up, and to the right. You would dial 2 minutes up, and 5 minutes right. If you read your reticle correctly, your scope is in good order, and you run the rifle how you are suppose to, your next shot should fall exactly where it is suppose to. There is a caveat to this method, and it goes back to making the correct decision when buying a scope. Most scopes reticles are in the second focal plane (SFP). This means that when you dial the power ring, the reticle stays the same size, but the image you see through the scope gets larger or smaller. As such, in order to get a correct and accurate reticle reading, second focal plane scopes must be set on the magnification power they are calibrated for. I will get into this in more detail in a later part of this article. Another problem with this method is when you cannot see your holes in paper or bullet impacts on anything at long range. Even with modern optics it can be very difficult to see bullet holes in paper past 300 or 400 yards, and this number varies greatly with conditions. Some days you can spot 30 cal holes out to 500yds, while other days you would be hard pressed to see them at 200. Seeing bullet impacts on steel, or in the dirt is much easier at distance. On freshly white-painted steel I can usually see impacts out to 1000yds or more. 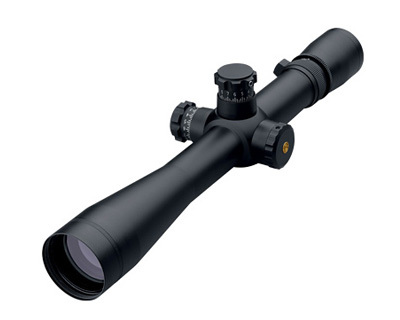 The distance you can see impacts is affected by your scope's optical quality as well as the environmental conditions. To combat this problem you can use high powered spotting scopes or a remote target camera. There are literally hundreds of different styles of MOA reticles available right now, and more are being created every day. One of the biggest factors when choosing a reticle for your scope is to get a reticle that is suited to the job at hand. You do not want a thin reticle like the NP-R2 for shooting deer at 50yds in the deep woods, but it would work very well for steel shooting or benchrest competition. Often your reticle choices will be narrowed a bit as you select manufacturers that produce a scope which meets the rest of your requirements. Two of the most important aspects of choosing a rifle scope is selecting your reticle and turrets. It is the source of confusion for many, as there are literally hundreds of different combination's. The most common is quite possibly the most wrong, in my opinion. Originally, the turret/reticle combination didn't matter much, because there wasn't much to choose from besides a standard duplex reticle. With the advent of the mil-dot, the choices became a little more broad. The mil-dot system will be covered in more detail later in the article. The most widely adopted tactical combination was to use a SFP (second focal plane) mil-dot reticle, and MOA turrets. One of the biggest offenders being the Leupold Mark-4 line. This grossly handicaps you when trying to read the reticle to make adjustments because of the "ruler" (your reticle) does not match your "inputs." (your turrets) So it is not a matter of just reading your reticle and making the corresponding turret adjustment. The mil system is a different angular measurement all together. One mil covers 3.6" at 100yds, while one minute covers 1.047. So to translate what you see via the mil reticle, you must multiply it by 3.44. It is close enough to 3.5 to get some mental slight of hand done, but it still means that you have to convert what you see in mils, to minutes before you can put the adjustment in the turret. So if you see that you hit 1 mil low, you must dial 3.5 minutes up on the elevation turret. If you were low by 2.5 mils you would have to take 2.5 x 3.44 = 8.6 minutes. Now, due to the fact that most MOA scopes have 1/4" clicks, you would have to dial to 8.5 minutes. If you had 1/8 MOA clicks, you could get closer, but scopes with 1/8 MOA clicks are not very practical outside of benchrest competition. This mismatched turret/reticle combination is the least desirable from a tactical standpoint. It is simply not fast enough to be competitive. A much more desirable setup is a matching reticle and turret. With the MOA system this is very difficult to accomplish due to the fact that a reticle with 1/4 MOA subtensions would be very cluttered and almost impossible to distinguish except on powers above 22x. Even then it would be difficult. As a result, when you get a scope with MOA turrets and an MOA reticle, the adjustments you still need to break the reticle down into imaginary subsections. With practice, it becomes easier, but when you start out it can be difficult even with a reticle subtended in 1 MOA increments. The farther the subtentions the harder it is to break down in your mind. One of the downfalls of the MOA system is that when you start shooting long range, you start to get into some big numbers. For a typical 308 shooting 175SMK bullets, you'll have to dial around 42 MOA to get to 1000yds. If you have a turret with 10 minutes per revolution, this means you have to turn it over 4 times before you get to your mark. That's a lot of cranking. Most shooters scoff at that remark and exclaim how its easy. However, if they ever get to shooting precision tactical type competitions they quickly change their tune. Within the last year, two scope manufacturers have listened to the community and developed new "high speed" turrets that give you much higher adjustment per turn of the turret. Premier Reticles has a turret which offers 100 minutes of adjustment within 2 turns, which when combined with their excellent MOA reticle and zero-stop effectively solves the speed problem. Even with the Premier optic, you still have to deal with the larger numbers. Now this is very much a personal opinion that will vary from shooter to shooter. Some people do not mind the bigger numbers. Most of these people are very math-oriented and can solve more complex equations in their head. Even for the people whom can manage the numbers very effectively, the communication barrier surrounding the MOA system can create a problem when shooting around other people. The MOA system is understood by most, but when trying to call out corrections to a teammate, or to paint a picture of a target engagement for a friend during a conversation it can be very clumsy. For instance, say you are the spotter for your friend in a competition. You run out to stage #1 and are presented with a cold bore shot at 1000yds. You are allowed 2 rounds at this stage, and it is worth 100 points in a 500 point competition. Obviously this is a very important stage. As the spotter your job is to call accurate corrections. The first thing the shooter has to do if he is using a scope bought prior to the last couple months is to start cranking away on his turret. If he is shooting a fast rifle, he'll only have to pull two or three revolutions. If he's shooting a 308 or something similar with heavy bullets, he's going to need at least 4. After he shoots, if he misses you will need to call out a correction. If you saw he was 4 1/2 MOA low and 3 3/4 MOA left, you will have to say "Come up four and a half minutes, and come right three and three quarter minutes, fire." Now you may not think that sounds very complicated, but introduce a time clock and pressure of collecting your $100 entry fee back and you would be surprised at the things that will trip you up. Granted this problem can be solved with training, but it does not make it easy to just lay down next to anybody and communicate effectively. Users that know the MOA system can easily transition to any other system, as they are all angular. It is just a different unit of measure. If you have a MOA reticle, you can call corrections for a shooter who is using mils, and vice versa. The accuracy and speed in which these corrections are called depends on how well you read your reticle, how fast you can convert the numbers, and how effectively you can tell the other shooter. However many minutes you see in your reticle, you will simply divide that number by 3.6, which will give you the correct adjustment in mils. It definitely won't be as fast or accurate as calling shots for someone that has a reticle matching your own, but it can be done in a pinch. 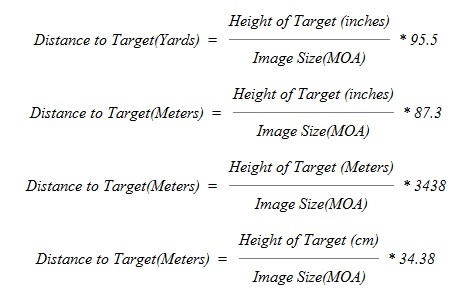 The final aspect of the MOA system we will talk about is how to estimate the range of a target using your reticle. Now that you understand how to read your reticle, this is a simple matter of a small equation. You can use any of the equations in the figure below to accomplish this task to give you your desired output and preferred inputs. First you take a measurement of the height or width of the target using your reticle. You take the height of the target in your chosen unit of measure, divide it by the reticle reading you got earlier, then multiply it by the number on the right. So, lets say you are shooting at an IPSC steel target, which is 30" tall, and you read the target is 6 MOA tall in your scope. You would take 30 / 6 x 95.5 = 477.5 yds. 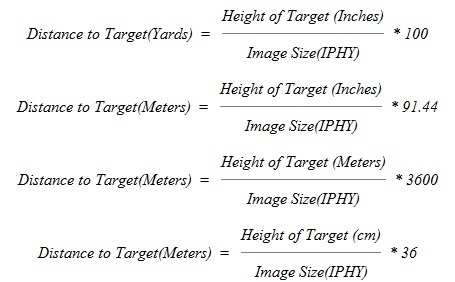 The Inch Per Hundred Yard (IPHY) system works in very much the same way as the MOA system, but is a slightly different unit of measure. We talked about the linear offset with MOA when working with whole numbers, in the capacity that 1 MOA = 1.047" at 100yds. The IPHY system eliminates this problem in that 1 IPHY covers exactly 1" at 100yds. Due to the MOA offset being so small, and the increasing insignificance of the linear measurements on target, the IPHY system has not gained much traction. Several scope manufacturers still offer reticles and turrets in IPHY for users that request them, but I do not see the MOA system being replaced by IPHY anytime soon. I'll list the ranging equations for IPHY for those of you that want them. In the next part of the Rifle Sighting System's series we will talk about the Angular Mil system from its inception to its current standing as the a favorite among tactical competition shooters.